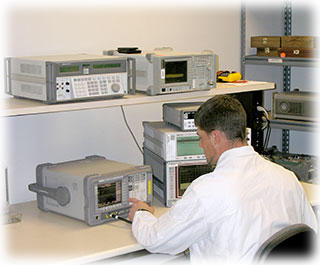 Anko Electronics Inc. provides calibration servicing of industrial precision measuring equipment. As a professional metrology organization operating since 1990, our intent has continued to be one-stop convenience by servicing electronic, RF and microwave, mechanical and dimensional, and environmental disciplines. Anko technicians are considered to be some of the very best in the business. This combined with Anko's aggressive Quality Assurance Program registered as ISO/IEC 17025:2005 and 100% Quality inspection assures your instruments undergo meticulous scrutiny prior to their return. While offering complete on-site and laboratory testing services, our calibrations are NIST traceable, the pricing competitive, and the quality unsurpassed.